Electoral Commissioner Patilias Gamato today made separate decisions on seven intending candidates who required clearance to nominate and contest the 2017 National Election. This is after various lawyers and candidates sought clearance from the Electoral Commissioner to nominate and contest various seats in the country. Mr. Gamato said he has allowed the seven intending candidates to nominate and contest the election in the light of the provisions the Constitution that limit, allow and qualify persons intending to nominate and contest the national general elections. Section 50 of the Constitution provides the right to vote and stand for public office. The limits are set out under sub-section 1 (a) to (e) of that provision. Mr. Gamato pointed out that the Constitution is very clear in that “every citizen who is of full capacity and has reached voting age has the right to vote and stand for public office”. The Electoral Commissioner further clarified that anyone who is serving his or her term in the prison as a State prisoner but if the prison term is less than nine months; he or she is free to pay his or her nomination fees and contest national general elections. Mr. Gamato pointed out that the Electoral Commission does not perform the functions of the court or the police force in interpreting and applying the law or enforcing the law. He said that those are functions performed by the appropriate bodies established by the Constitution, adding that if PNGEC was to do so it would exceed its primary function which is to organize and conduct elections. a. The Supreme Court has allowed him to nominate on April 26, 2017 therefore I have allowed him to nominate and contest the election. a. Mr. Kennedy was imprisoned at Bomana Correctional Services. He has appealed the decision. Mr. Kennedy has the right to nominate under the Constitution so he is allowed to nominate and contest the election. a. Mr. Potape faced allegations of misuse/misappropriation. The courts have cleared him so he can nominate and contest the election. a. Mr. Yali is out on parole. He is no longer in prison any more while his pardon is still pending. His term is less. Section 50 (1) (a) allows him to nominate to contest the election. a. The Leadership Tribunal found Mr. Kondra guilty of misconduct in office under the Leadership Code. His application for judicial review was dismissed by Court. Mr. Kondra resigned as Member of Parliament therefore he is no longer a leader. He is free to nominate and contest. a. There is no age limit for nomination and contesting after passing the legal age limits to contest as MP. 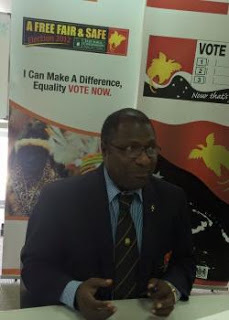 Sir Peter Lus can therefore nominate and contest the election. a. The Supreme Court appeal was argued but the decision is still pending. Therefore Mr. Wobiro can nominate to contest the election.